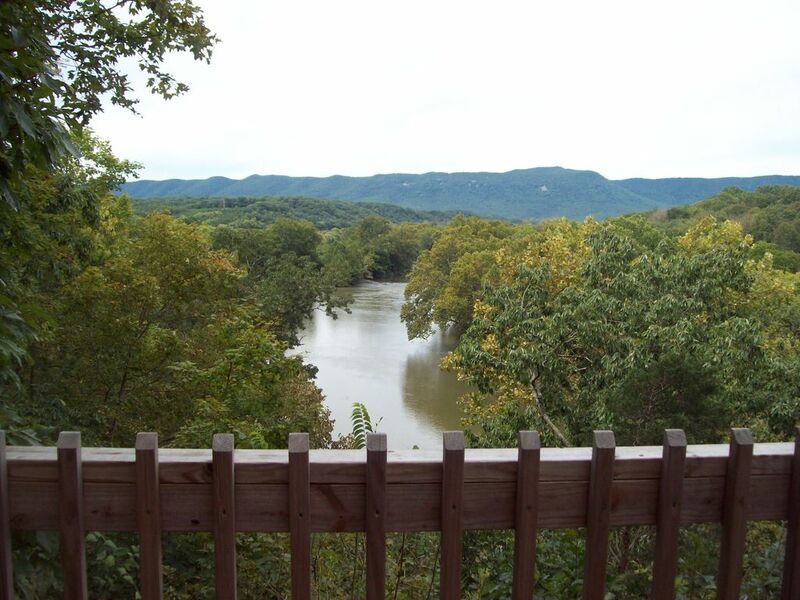 Enjoy a spectacular view of the Shenandoah River and the Massanutten mountains from the brick patio or the new wooden deck. The large great room has an open ceiling is furnished with a queen size sofa bed and matching love seat surrounding a beautiful wood burning stone fireplace and a small dining area with a view of the river. A fully equipped kitchen including microwave, dishwasher, toaster, and coffee maker allow for 'dining in'. A small full bath with a shower & tub completes this perfect vacation spot. The pathway to the river is quite an adventure with the wooden foot-bridge and stairway that takes you to the river’s edge for swimming, fishing or just dipping your toes. This cabin does not have direct boat access from the property, but there is a public boat landing 2 miles from the cabin. Cozy cabin is located on a gated private gravel driveway which is 7 miles from Front Royal, VA. The cabin is three miles from the Shenandoah State Park and five miles from the northern entrance of the Skyline Drive of the Shenandoah National Park. Many of our guests enjoy local hiking, fishing, canoeing, and mountain biking and wine tasting at one of the thirty wineries within 30 miles of the cabin. Your home away from home – The perfect retreat! • Maximum number of overnight guests on the property is 4 people. Location, location, Location- Our cabin is the perfect home base for all your outdoor activities and adventures in the Shenandoah Valley. Our log cabin is secluded and built on a 100 foot cliff above the Shenandoah River with 35 acres of privacy. The Shenandoah River State Park and the Skyline Drive northern entrance are both only a ten minutes drive. The newly built Canopy Tours zip line was just open in the summer of 2014 which takes over 3 hour to complete. If you’re more interested in water activities; swimming, fishing or boating is all just a walk or 10 minute ride. There are three boating companies in the area which offer numerous options for floating down the river. Did someone say wine tasting? There are over 30 wineries within 30 minutes of our cabin with new ones opening every year. We hope you will choose our home base for a memorable getaway. Fully equipped kitchen including microwave, dishwasher, toaster, and coffee maker allow for 'dining in'. Front Royal, Warren County and the surrounding area are rich in history and natural beauty and offer many unique and varied year round recreational and leisure activities sure to satisfy our visitors. It is also known as the Canoe Capital of Virginia. thanks in part to the 39 miles of scenic waterways better known as the North and South forks of the Shenandoah River that meet just west of the town of Front Royal, and the main river that continues toward Clarke County, northward. In Warren County the river offers calm waters for a leisurely canoe ride and rapids ideal for kayaking. Boating, rafting and tubing also are popular. Please note, outside camping is NOT allowed on the property. The maximum number of overnight guests on the property is 4 people. We do NOT allow parties on the property with outside guests without written approval from the property manager. Property was very clean and beautiful inside! Nice secluded area with a wonderful view of the river! We were very happy with this cabin that we chose. When we arrived we found that there wasn’t much firewood for a fire, but my husband was able to find firewood so we were good to go! The view was absolutely gorgeous! The inside of the cabin was very clean! Everything in the description was accurate so there were no surprises. The tv didn’t receive too many channels but most people aren’t going to watch tv. However the weather was raining and cold during our visit so we ended up renting movies each evening. The cabin was in close proximity to the town so that was great! Getting the key and returning the key was convenient so that was nice! The walk down to the river was definitely steep and at the bottom there wasn’t much land to stand on so even if fishing would’ve been an option we didn’t see where you could really do that there. There was also a weird cave next to the steps going down to the river which was a little creepy. We could see a small animal of some sort was using the cave because of footprints. We saw lots of birds while there and a bald eagle our first night there! If you’re looking for a nice, clean , secluded spot to get away, this is it! Very relaxing and everything in the cabin was comfortable! We had a great time and there is honestly nothing negative we could say about our experience! The cabin is perfect for a romantic getaway - rustic in look, but with all the modern amenities to keep you comfortable. The bed and couch were both very comfortable, the views from the porch are amazing, and everything in the cabin was in clean, working condition. We would definitely stay here again! Thanks for taking the time to provide feedback on your stay. We appreciate your comments regarding your stay and hope you will return again soon. Cozy rustic cabin with beautiful surroundings! We had a wonderful stay at this cabin, it is cozy, comfortable and rustic which we loved. The property is stunning, beautiful river and mountain views. Excellent location as well! We dined in Front Royal for dinner and drive to Luray for the caverns and hiked Mary’s rock along the Appalachian trail because Shenandoah National Park was closed due to ice. It ended up being a perfect alternative! We would definitely stay here again. I’ve rented all along the river and this is my favorite one yet. Looking forward to trying one of the larger cabins. We appreciate all feedback from our guests. We hope you will return again soon. Thank you so much for letting us stay at your cabin. It was a great getaway and the right amount of coziness and access to civilization if we needed it. We also got engaged there so we hope to come back at some point! The cabin was absolutely perfect for a family of 4, plus a dog and cat, and had everything we needed. It was quiet, clean, peaceful and cozy. The kitchen had all utensils, and the fireplace helped keep the cabin warm. The views could not be beat, as we felt we were directly over the river. Things to consider: finding the cabin was a bit difficult. I confused it with the cabin up the hill, so a sign directly in front of the cabins would help. The cabin could have used a few more blankets for those sleeping on the pull-out couch. And yes, the cabin is in the woods so it's expected that mice would get in. But I was still a little shocked to find our cat killed a mouse in the actual cabin. While guests are not staying in the cabin, traps should really be set to deal with that problem. • Pets friendly-additional deposit may be required: $15.00/pet/ night Please note, outside camping is NOT allowed on the property. In addition, the maximum number of overnight guests on the property is 6 people. We do NOT allow parties with outside guests on the property without written permission from the property manager.